Back in the kitchen again. This is my new lunch container. Allison has a matching one as well. They are called the Mr. Bento Lunch Jar. This thing is great. 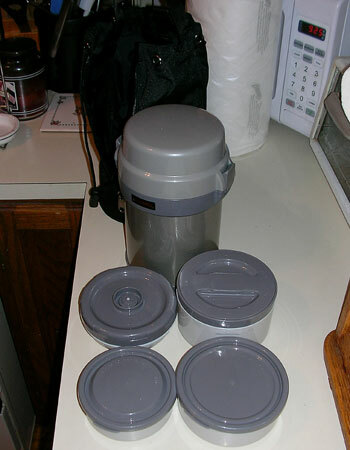 Each container stacks upon the other and is put into the Mr. Bento Lunch Jar and it keeps food really cold or hot, depending upon how you store it. We used it for the first time today. Tonight we grilled a bunch of chicken breast for lunches and some steak tips for dinner. With all the grilling I do I’ve got to get myself one of these, the Grillslinger. That’s way better than a Victoria Secret bag! Yep, it certainly is better than a Victoria’s secret bag. I read about the bento experiment, very interesting stuff. My wife and I both have these and love them.